The Bear at 8 p.m. on Oct. 27 from mid-northern latitudes. This is the time of the year when bears start to hibernate. They're usually not holed up for the entire time (it's probably more appropriate to think of hibernation as a really deep sleep or a series of very long naps), but the American black bear can go up to 100 days without waking up. Most bears generally enter hibernation in October and emerge sometime in April or May, when their food is plentiful again. And so it is in our current early evening sky, that the celestial big bear is following its earthly cousins and also going into its own stage of hibernation. 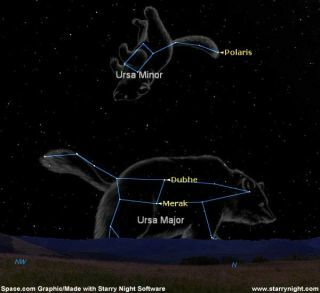 This week, as darkness falls, we can see Ursa Major, the Great Bear, low in the northwest sky. Its lower extremities are currently out of view, lying below the horizon. Each week, the Great Bear will crouch a little lower and by late December, it will be almost completely out of sight as dusk settles-save for the seven bright stars that form the familiar pattern known as The Big Dipper (known in Great Britain as "The Plough"). For localities north of 35-degrees latitude, the Dipper will be sitting, right side up, just above the northern horizon [sky map]. Shortly thereafter, the Great Bear will start climbing up from beyond the horizon, fully emerging into view low in the northeastern part of the sky after sundown by the beginning of February. And by April and May, both the Bear and the Big Dipper will be soaring high into sky almost directly overhead, just as bears here on Earth are rousing themselves after another winter of inactivity. Of course, we needn't wait for the arrival of spring to enjoy the sight of Ursa Major high in our sky. At this time of year, just head outdoors prior to the first light of dawn and you'll be treated to the same view of the sky that you'll have during more convenient early evening hours about half a year from now. Also of special interest for those who stay up through the night is watching the gradual change in the apparent size of the Big Dipper as it steadily ascends the northeast sky, and gradually fades from view as a shrunken upside-down utensil with the advance of dawn's early light. This is known as the "Moon illusion," an optical illusion in which the Moon and Sun appear noticeably larger near the horizon than they do when they are higher up in the sky. Indeed, this effect also causes the constellations to appear much larger when hovering near the horizon. But as the hours pass, you'll notice that not only does the Dipper appear to shrink as it climbs up the sky, but its actual shape-the relative size of the handle and bowl-will also appear to vary. For when the handle is still close to the horizon as it begins its northeastward ascent-around midnight or 1 a.m.-it will look disproportionately large when compared to the bowl. Yet, it is only our eyes that are fooled. If you were to take a picture of the Big Dipper oriented in that position, it will appear quite normal. In fact, no matter what position it's photographed, the Dipper's size and shape will appear exactly the same. George Lovi (1939-1992), a long-time planetarium lecturer and columnist for Sky & Telescope magazine used to love pointing out what he called the "maddeningly incredible" illusion involving the Big Dipper. The distance between the two very familiar pointer stars at the end of the Dipper's bowl (Dubhe and Merak) is equal to five and half degrees. In our sky, the Moon is just a half a degree wide. That having been said, try to imagine lining up 11 full moons in the space between the pointer stars. "Impossible?" George would ask his audience in a quizzical tone, "But-yes, verily-there is indeed just enough space to accomplish the task!"